· First remove all the shells and clean the prawns properly. Drain all the water. · Add 1/4tsp of salt, 1tbs of Turmeric powder, 2tbs Refined Oil, 2tbs Corn Flour Powder, 1tbs Ginger Garlic Paste & 2tbs Curd to the Prawns and marinate it. · Deep fry Potato pieces and keep aside. · Take 2tbs of refine oil in a pan on medium heat. Add prawns and fry till orange color then keep aside. · Take the rest of the oil in the Pan, add panch-phutan. · When spluttering stops add finely chopped onion and green chilies & keep frying till the onions turned to golden color. · Add Ginger, Garlic paste, Coriander Powder, Turmeric powder, chili powder and fry. · When the raw smell is gone add cut tomato and salt. · Keep stirring the masala cooking till it leaves oil around it. Then add 1tbs soya sauce, 2tbs tomato sauce & keep on stirring. · Then add the 2tbs curd in to masala & stirring for 2mins more. 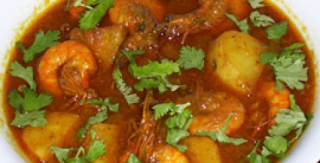 · Then add fried prawns, potato and meat masala and mix properly. · Now add 2 cup of water to it and bring to boil. · Cook for 3-4 minute then garnish with fresh cut Coriander Leaves. What is the difference between System Verilog Dynamic Array, Associative Array & Queue and their applications? Sign-up for our email newsletter and get updates when new posts are published on My Conscientia. My Conscientia by Sangeeta Patel is licensed under a Creative Commons Attribution-NonCommercial-NoDerivs 3.0 Unported License. Author : Sangeeta Patel . Powered by Blogger.